The VB12 is a portable broadcast monitoring and measurement platform. It supports optical, electrical GigE Ethernet and RF inputs, separate management port and both ASI input and output. The VB12-RF covers all the monitoring needs encountered in hybrid IP multicast, OTT and RF networks. The unit is particularly suited for use in FTTH IP multicast scenarios or at regional points of presence in cable architectures where IP and QAM is encountered. The VB12-RF has further use in ATSC terrestrial networks where 8VSB is used as modulation method. Designed for the rigors of real-world use, the VB12-RF is smaller and lighter than any comparable monitoring/troubleshooting solution. The VB12-RF can monitor 10 IP SPTS/MPTS services simultaneously and can be optionally expanded to support a maximum of 50 services. 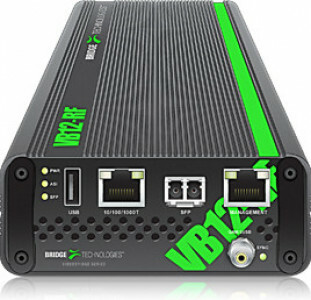 Providing the field engineer with all of the interfaces needed for broadcast or IP analysis at any location in the transmission chain of both cable and terrestrial broadcast operations, the VB12-RF requires no external equipment or power supply and is able to withstand harsh operating conditions. The VB12-RF is also capable of extracting thumbnails from any of the input streams. It is possible to make a recording of a service, or it can be forwarded to a remote destination via the Ethernet data or management port for further content analysis. Innovative functionality makes it possible to directly compare signals across different probe interfaces.